This integrated geography programme combines human and physical geography, and offers opportunities for specialisation and a year spent studying abroad. Those choosing the BA will usually have studied social science or humanities subjects at A level or equivalent, but it is possible to transfer to the BSc if your interests develop differently. We offer a wide range of optional modules and have a particularly low staff-to-student ratio (Guardian University Guide 2018), encouraging individual choice and personal supervision. We are proud of our consistently high research record. You will therefore be working with thinkers at the cutting edge of developments in their fields. The Geography BA and BSc share core elements at the start, providing you with a strong geographical foundation on which to build. In year one you take two core modules and four optional modules, one of which can be outside the department. In year two, compulsory modules are supplemented by six optional modules, including field research based courses, selected from a substantial pool. It is now possible to begin focusing on topics such as development geography, environmental and conservation management, urban geography, GIS and climate change. You will spend your third year abroad at an approved university. Your dissertation is the main focus of year four, and you will also take further optional modules. Fieldwork throughout the programme can take place both in the UK and abroad, and it is also possible to base your dissertation on an overseas project. Recent destinations include Australia, Belize, India, Montserrat and Papua New Guinea. Financial support for overseas fieldwork may be available through expedition funds. You may also take one 0.5 credit module taught outside of Geography if you wish. Physical Geography: Ecological Patterns and Processes; Environmental Remote Sensing; Geomorphology; Hydroclimatology; Reconstructing Past Environments; Statistics for Environmental Geographers; Physical Geography Fieldclass. There are no optional modules in year three. You take 2.5 credits of advanced modules from the below. You may also attend a field class (0.5 credits), study abroad for a term (1.5 credits), or enrol on the independent study module involving close collaboration with one academic (0.5 credits). 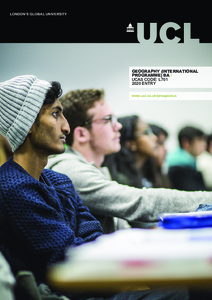 Detailed course descriptions are available on the department website: Geography (International Programme) BA. Field courses in the second and third years are partly funded by the Department, and partly self-funded by those students who choose to take them. The Department also provides bursaries for those students who are in receipt of a UCL bursary and who wish to undertake these courses. Further details are available on our website. The Geography BA and BSc degrees follow similar paths. Although it makes no difference to the module choices open to you, most applicants base their degree choice on the A level (or equivalent) subjects they have followed: BA if they have taken arts or social science, BSc for those with sciences. It is possible to transfer if your interest develops in a different direction.